Brilliant review and such a brilliant accomplishment Vishy. When I see bloggers finished one of those daunting chunksters I feel so overwhelmed and wanted just to run over and give them a cyber-hug or something to celebrate…. Now that I have so many books on the queue, it’s hard to concentrate on a Chunkster and savour the reading experience when you feel the pressure to read the other books on the pile! Thanks for your comment, JoV 🙂 I agree with you that the pressure of the ‘TBR’ pile, makes it difficult for us to read chunksters. I gave up on a couple of chunksters last year that way, but I am hoping to pick up one of them again this year and start where I left off. Thanks for your suggestion on de-cluttering thoughts and ‘TBR’ pile. I will remember it when I tackle my next chunkster. Thanks Bina 🙂 Hope you get to read ‘Middlemarch’ and enjoy it. 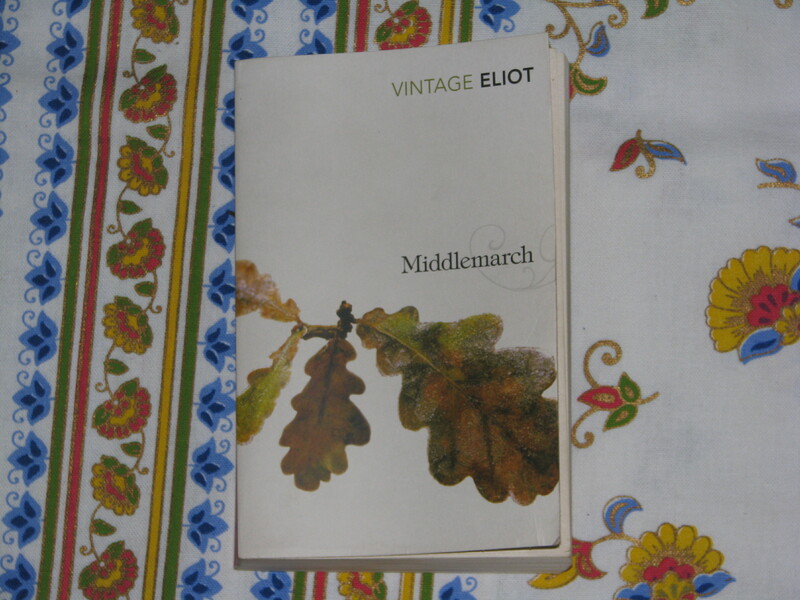 I had the same experience of greatly enjoying the first bit of Middlemarch and then slogging through for a while, except that I got tired of it and gave my copy of the book away to a charity shop. One of these days I’m going to pick it back up again. I read Silas Marner and really liked it. But it is a MUCH shorter book. I hope to tackle this one someday, especially after reading your lovely review. Glad to know that you liked ‘Silas Marner’. I hope to read it sometime – it is there waiting on the bookshelf. Thanks for stopping by, Melanie 🙂 Glad to know that though the book lagged in the middle for you, it got interesting later and you loved many of the characters. Yes, it is sad when so many lives don’t live up to their ideals. My experience with this book was similar to yours (and several of the other people who have commented). After enjoying the first few chapters I started to find it very slow moving and almost lost interest, but eventually I became so absorbed in the story that I didn’t want it to end! I’m glad to hear that you enjoyed it too. Thanks for stopping by, Helen 🙂 Glad to know that though the book moved slowly in the middle it became better after that and you didn’t want it to end. I am also amazed that you are participating in a read-along of ‘Bleak House’ now! That is also a big ‘chunkster’ and hope you are enjoying it. thanks for bumping this up on my list. i’ve only read Silas Marner but this was in 7th grade!! so way too long ago as it’s been 5 years since i graduated college. Hope you enjoy reading ‘Middlemarch’, Linda. Would love to hear your thoughts on it, whenever you get to read it. I haven’t read ‘Silas Marner’ – my sister read it when she studied literature in college and so the book has been at home for quite sometime now. Am hoping to take it down from the bookshelf and read it sometime in the future. Vishy, I knew your thoughts on this would be a joy to read, and you did not disappoint 😀 I particularly loved what you said about the word “love” being an umbrella term for many different emotions – Eliot does a GREAT job of showing all the nuances, doesn’t she? Sometimes I think disappointments and mismatched expectations would be easier to avoid if we had more precise terms. But then again, maybe labelling feelings even MORE precisely wouldn’t be a good thing. I can’t wait to find out if Zadie Smith is right as I get older. I have a feeling she is. Glad to know that you liked the review, Ana 🙂 Thanks for hosting the read-along. I agree with you that Eliot did a great job in showcasing all the nuances of ‘love’. I also agree with you that labelling feelings precisely has its pros and cons. Thanks Amy 🙂 Glad to know that you liked the references to the desert 🙂 Hope you get to read ‘Middlemarch’ and like it. I can understand your reaction to ‘Silas Marner’- even the name looks quite serious 🙂 It has been lying on my bookshelf for ages – my sister read it in college – but I haven’t tried reading it. Maybe I will do that now. Hope you get to read ‘Middlemarch’ and enjoy reading it. I highly recommend Adam Bede. It remains one of my favourite classics. Thanks for the recommendation, Jennifer! I will add ‘Adam Bede’ to my ‘TBR’ list. I was waiting to comment on the other Middlemarch readalong posts until after I’d written my most recent post on it. Great review: I love how you say the book started ‘singing’ to you – it really does entwine itself into the reader after a while. And Middlemarch is so immensely quotable – you’ve picked some great ones in your excerpts at the end. Thanks for stopping by, Christy 🙂 Glad to know that you liked my review of ‘Middlemarch’. Hope you enjoyed reading it too. I am not off to read your post on it. Thanks for stopping by, Nishita 🙂 Glad to know that you liked the review. Hope you are enjoying ‘Middlemarch’ – it is a beautiful book. I will look forward to hearing your thoughts on it.